We want to be YOUR Service Company! McNamara Custom Services is your premier local service contractor for local services in Waco, Texas. Call to schedule up-front pricing and an in-person evaluation from a licensed and trained professional. Our family of commercial technicians at McNamara Custom Services use quality parts, as well as the best service for any Central Texas business or industry. Call us today at (254) 836-4304 to schedule up-front pricing and service for your commercial Plumbing, Air Conditioning, Refrigeration, or Mechanical needs. Need a reliable Plumbing service contractor? You might ask yourself, "Where can I find a Plumber near me?" Look no further than McNamara Custom Services. We are your premier Waco plumbing maintenance experts. Our technicians are focused on serving the Central Texas community with the highest level of service and quality with reasonable prices. Our commitment to quality is reflected in every job we complete, from a simple drain cleaning service to furnace heating or air conditioning replacement. There is no job too small, beyond our control, or the control of a technician from McNamara Custom Services. We can help you get your particular problem settled in no time at all. Just give us a call, to secure an immediate visit with up-front pricing from a licensed technician. You can also click read more and check out McNamara Custom Services’ customer reviews. Did you know that our great relationship with many manufacturers for over 35 years of business enables McNamara Custom Services to offer the Waco, Texas community great prices on licensed services on many types of Air Conditioning using quality manufacturer parts. 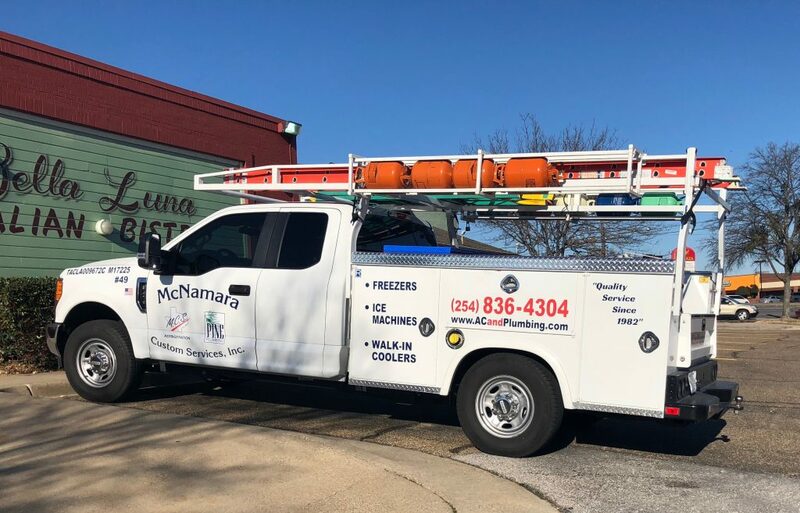 No matter the job you require a licensed contractor for, between licensed Air Conditioning, Plumbing, and Mechanical, McNamara Custom Services has you, your home, your family, and your business covered. Our schedule fills fast, call now to secure your visit to ensure that your needs are fulfilled and you can always call us at a later time if you need to change or cancel your appointment. If you're looking for AC replacement, AC installation, or AC repair. If you need an Contracting Expert who specializes in chilled water and steam piping systems. If you aren't sure if your home sewage or plumbing issue is caused by the state, or your home, we can help. Just give us a call and schedule an honest estimate best suited for you before any work begins. Secure your licensed business or home service with up-front pricing and evaluation now by calling (254) 836-4304. Call McNamara Custom Services today at (254) 836-4304 and see how we can make your day better with honest estimates, quality workmanship, and a dependability that is hard to find with other commercial and industrial contractors! Waco, Hewitt, Lorena, Woodway, Beverly Hills, China Spring, Lacy-Lakeview, Bellmead, Robinson, McGregor, Gatesville, Valley Mills, Moody, Mart, Marlin, Temple, Belton, Troy, Bruceville-Eddy, Houston, Dallas, Austin, Round Rock, Salado, Georgetown, Hutto, Taylor. Serving many cities in Texas for over 35 years since 1982, MCS, is here to support your family with honest prices and OEM quality parts installed licensed AC Techs, Plumbers, Sewer Repair, Refrigeration, Refrigeration Repair, and HVAC. These are just a few of the services we regularly complete for our customers. Call us at (254) 836-4304 to discuss your specific contractor needs and get the process started. What Sets Us Apart From Other Licensed Contractors? Our family at MCS understands that Plumbing, Refrigeration, or HVAC failure is never convenient. That’s why we give all of our customers the personal attention they need and deserve. We work closely with you to discuss the situation and help you decide on the best course of action. Our friendly and knowledgeable technicians take the time to listen to your needs, and make sure all of your questions and concerns are addressed. Leaving no detail overlooked. Helping our neighbors solve their problems is what motivates our team to deliver the best service at all times. You can expect to be greeted warmly when you call and provided with expert guidance, through every step of the process. We keep our trust and communication strong between technician and client, so you will know exactly what to expect from start to finish. There is no room for surprises. At McNamara Custom Services we work as a team to help our customers resolve their maintenance issues. You can rely on our combined support to establish greater system efficiency and reliability, leaving you with long-term peace of mind. McNamara Custom Services is not out to gouge you on our services. Our Plumbing technicians will never sell you a product or service you do not need. Instead, we want to provide you with high-quality service at the most reasonable prices. We understand that you have many other priorities to handle, and a home or business maintenance issue can put a damper on your productivity. Don’t let a home or commercial maintenance problem turn into a disaster. Get the issue resolved now with a quick call to McNamara Custom Services for AC, Plumbing & Refrigeration state wide in TX. Flexible scheduling available to meet your needs. Contact us today at (254) 836-4304 to speak with one of our experts. Serving the greater Waco area for over 35 years.